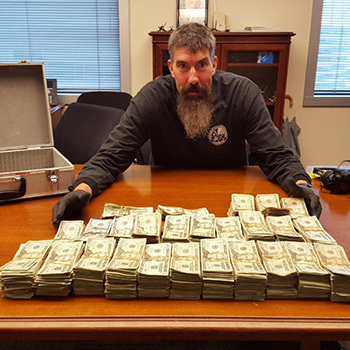 Community Response Unit Specialist Thomas Grabski displaying the confiscated cash. TACOMA – A state Department of Corrections’ specialist, assigned to the FBI’s South Sound Task Force, arrested a wanted drug dealer and confiscated more than $100,000 in cash and five pounds of methamphetamine at a residential duplex last week. Officer Thomas Grabski got a tip last month that Robert Henrickson, a wanted felon, was storing and selling large amounts of drugs. After tracking down his location in Tacoma, and watching him for a few days to make sure that’s where he lived, Grabski and several other officers arrested Henrickson when he walked outside his home this past Thursday night. Henrickson had previously served time in prison for a drug offense and had a warrant out for his arrest because he’d violated the terms of his DOC community supervision. Grabski made the arrest with the help of officers from the Tacoma Police Department and the FBI’s South Sound Gang Task Force. The arrest “is going to make a lot of drug users unhappy. It’s not going to solve all the street problems, but it definitely puts a damper on things in that neighborhood for a while,” said Grabski, a specialist with a DOC Community Response Unit, CRU, located in Tacoma. He’s one of 30 CRU specialists located across the state tasked with tracking down wanted felons. Henrickson tried to run away when he saw the officers approaching, but was quickly surrounded and arrested without incident. When Grabski and the other officers walked inside his home, they found a small suitcase stuffed with $113,000 in cash, mostly in $20 bills, along with the meth and several baggies full of marijuana. Henrickson was booked into the Pierce County Jail on drug charges. The United States Attorney’s Office has been contacted regarding the case. A decision to take this case federal is pending.